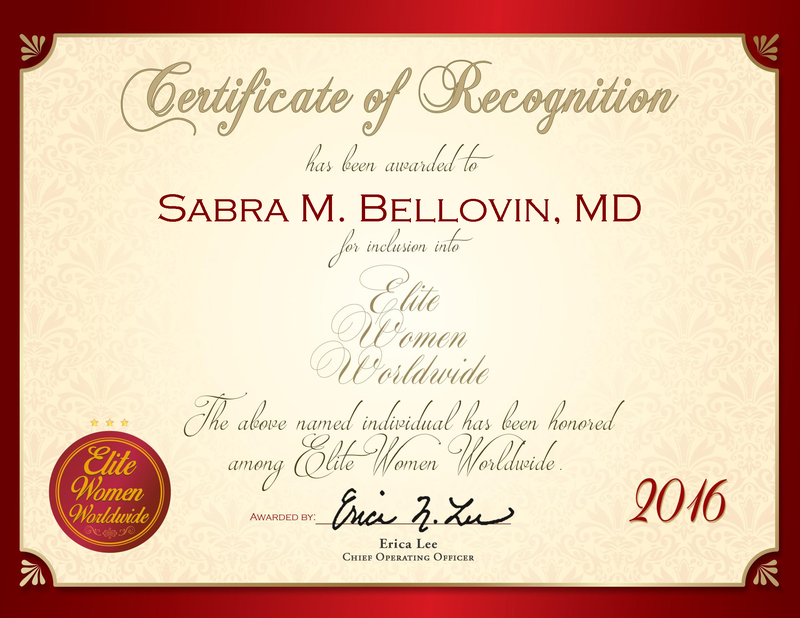 Portsmouth, Virginia, January 15, 2016, Sabra M. Bellovin, Doctor at the Internal Medicine of Northern Virginia and the Southern Virginia Health Systems, has been recognized by Elite Women Worldwide, for dedication, achievement and leadership in health care. Recognized for nearly two decades of outstanding geriatric and disabled health care services, Dr. Bellovin is marked by her respectful and kind demeanor when treating and interacting with patients. At Internal Medicine of Northern Virginia she treats patients suffering from chronic fatigue and associated conditions, including fibromyalgia, sleep disorders and chronic Lyme disease. At Southern Virginia Health Systems, she treats patients who are insured, uninsured and under-insured. She is on the forefront of using cutting edge technologies and tools to enrich the lives and health of her patients. In addition to her specialty in caring for older patients, Dr. Bellovin is an expert in treating tick-borne diseases. Dr. Bellovin attended the Eastern Virginia Medical School and earned an MD in 1996. This achievement led to her board certification in family medicine and becoming licensed to practice in the state of Virginia when she began her career in 1997. She is affiliated with the American Academy of Family Physicians, the Medical Society of Virginia and the International Lyme and Associated Diseases Society. Her career has been recognized with the Compassionate Doctor award from 2009 to 2013 and is one of the Top 10 Doctors by State in Family Practice in 2014. The success of Dr. Bellovin’s career is pinpointed to the people around her that have supported her. Dr. Bellovin maintains that working with outstanding colleagues who share her vision of contributing to the success and the well-being of the patients. In addition, Dr. Bellovin credits her family and friends for being supportive of her endeavors and helping drive her passion for helping others. In the coming years, Dr. Bellovin intends to continue her quality care and expand her outreach into the community to ensure health optimization.